Congratulations to our very own Tim Paap on being elected to the board of the Illinois Auto Body Association! AASPI’s Annual Meeting will also include the election of officers and directors. Current President Bob Gottfred of Erie LaSalle Body Shops will be re-elected, as will Vice President Doug Fiala from Douglas Auto Body and Secretary/Treasurer Paul Mason of AutoNation. Mayers Collision Center’s Joe Mayer will continue to serve as a director for the association alongside newly elected directors Tom Stiefbold of O’Hare Auto Body and Tim Paapfrom Paap Auto Body. Paap Auto Body was chosen to receive the award for Estimating Accuracy and lowest supplement ratio out of a group of 300 Collision Centers that belong to the Collision Advice Legacy Group. Our Paap Auto Body team strives to write estimates that are accurate to ensure that we get your vehicle back to pre-accident condition as quickly as possible. We pride ourselves on staying up to date on the latest technology and techniques to safely repair vehicles according to each manufactures specifications. We contribute our estimate accuracy award to the dedication of our estimators who strive to write a complete as possible visual initial estimate, followed by our blueprinting process and our technicians doing a 100% disassembly of all damaged areas on every vehicle. Thank you to our dedicated Paap Auto Body team! At Paap Auto Body, your safety is our main concern. When you bring your vehicle to Paap Auto Body, you can be sure that we will repair your vehicle using the proper equipment and manufacturing guidelines. We are a Certified Repair Center for all major manufacturers. It takes a lot of training to maintain these certifications. 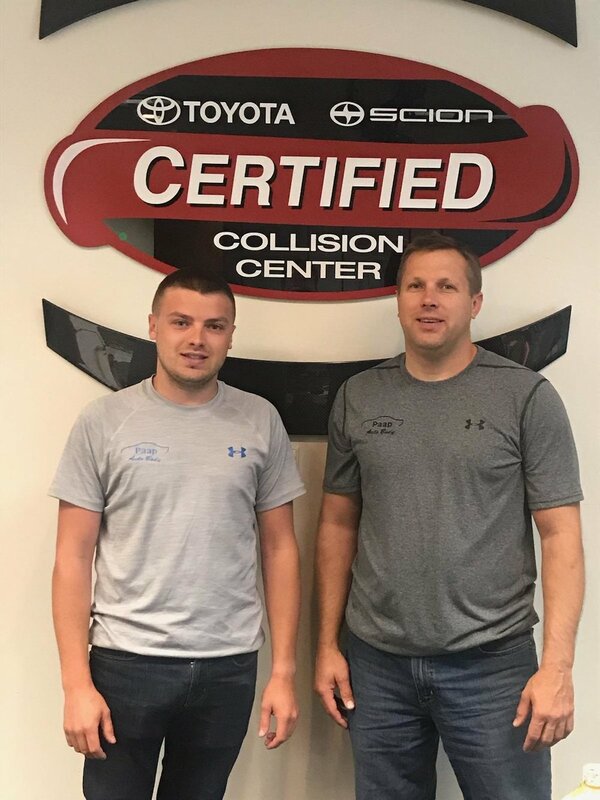 Last week Tim and Zack attended Toyota Collision Training in California and have now added Toyota Scion to their list of manufacturers they are factory trained Collision Centers for. 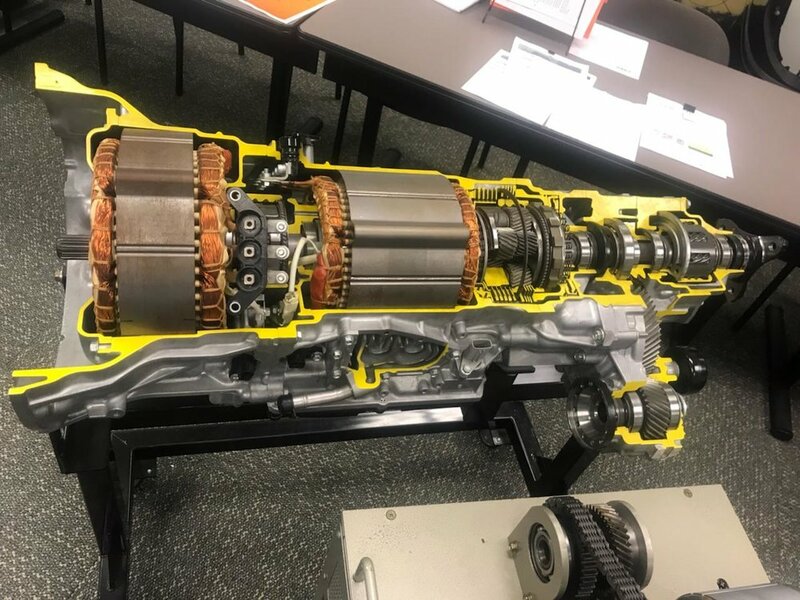 We learned about all the hybrids – what to be aware of, how to repair them properly after a collision, the type of welding equipment needed and required procedures. 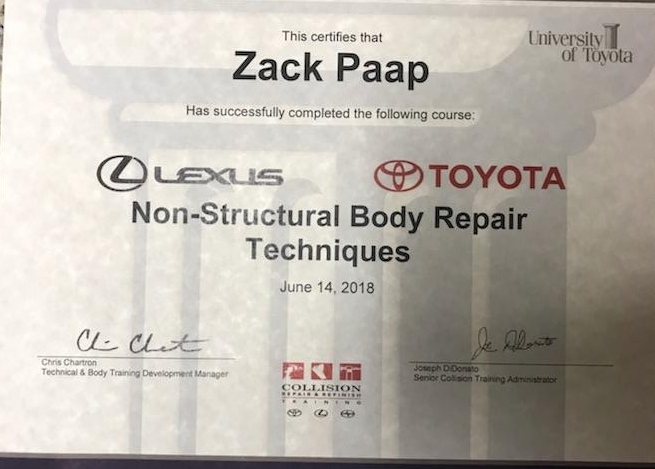 As the only Toyota Factory-Trained Collision Repair Center in the area, Paap Auto Body now has all the proper equipment and Toyota training to get your vehicle back to like-new condition. If you are in the unfortunate situation of being in need of bodywork for your vehicle, please consider Paap Auto Body where you can be assured that when you get it back after the repairs, it will be in pre-accident condition. Stop in today for a free estimate. Our Paap Auto Body team just got back from Axalta paint training! With all the new colors and metallic colors coming out we stay up to date on the latest techniques and products to offer our customers. We got trained on all the new products and how to work the new paint camera from Axalta which is unbelievable!!!! It takes a picture of the paint and tells you what's in it and how to mix it for that perfect match. We are constantly investing in our team to bring our customers the latest and best possible product on the market. At Paap Auto Body, we're constantly staying up to date on the newest repair procedures for your vehicle. I just returned from a three day conference in Lumbard, IL, where we learned about Original Equipment Manufacturer (OEM) requirements and repairs for a safer vehicle. Only about the top 10% of autobody shops in America that are concerned about consumer safety attended this training. We make sure your car is properly repaired so it's safe for years to come. We just returned from three days of training in Naperville at the Collision Hub Repair University "SPEC OPS" Course! We make it a priority at Paap Auto Body to stay up to date with proper repair procedures. We learned about today's vehicles and the proper repair procedures from the original equipment manufacturer. What does that mean for our customers? They will know that their vehicle was repaired properly the first time, the way the manufacturer intended it to be. At Paap Auto Body we are dedicated to providing quality workmanship that ensures our customers safety after collision repairs are completed. Todays cars are being made with several types and strengths of steel. The newest material that manufactures are now using is aluminum. These materials all have specialized welding requirements. At Paap Auto Body we are just as concerned about the how these materials are being welded onto vehicles during the repair process as the manufacturers are. 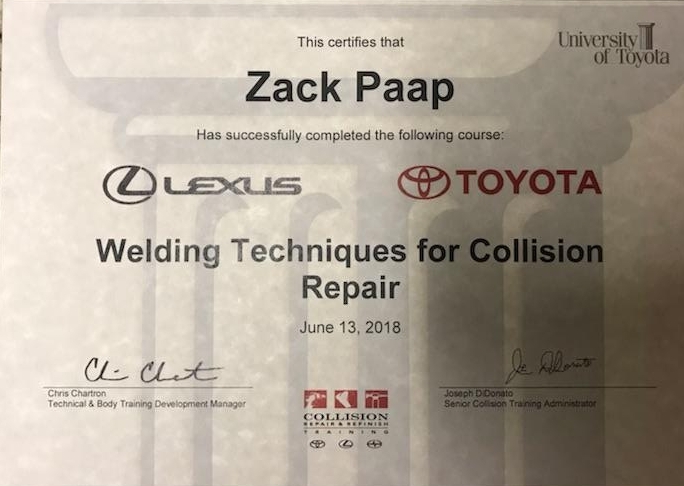 To ensure that we are performing safe and proper welds at all times the Paap Auto Body team recently went through extensive steel and aluminum welding training and have earned certification necessary to perform proper welding during structural collision repairs. This certification is our promise to you that when we weld on your vehicle we are committed to maintaining the structural integrity and will return your vehicle to you at the end of our repair process as safe as it was before your accident. We are the only collision shop in the area that has completed this specialized steel and aluminum welding certification and have also passed the necessary comprehensive evaluation of our infrastructure and our equipment to ensure that our facility is set up to perform safe and proper welds. We hope that our commitment to safety is as important to you as it is to us and you will consider bringing your vehicles to Paap Auto Body in the unfortunate event of a future accident. If any of your family or friends are in need of collision repairs, please consider referring them to Paap Auto Body as well. At Paap Auto Body we are setting the new standard for excellence in collision repair. We strive to be the best at everything we do. Our facility has all the state of the art repair equipment. We are an environmentally friendly Go Green business due to our water based paint. By using this product we have cut our waste material and pollution that body shops can put into the air. We stay up-to-date on all the latest collision repair technology. We would like to invite you to come by and meet our professional staff. We are here not only to take care of you and your collision needs but to give back to the community. With out all of you we would not be where we are today. We are constantly working to raise the bar on our services. If you have any questions or concerns about your experience, please let us know. Support is available 24/7.